With mobile payment service Samsung Pay set to launch in the U.S. on September 28th (after undergoing beta testing in the states), Samsung has updated the feature to version 1.3.1716. The update adds "Simple Pay," which allows you to control where Samsung Pay will launch on your handset, so that it will be ready to use when checking out at stores. With this new feature, you can swipe up from the fingerprint scanner to the screen to activate Samsung Pay when in the Lock screen, the Home screen, or when the screen is off. Fingerprints are required to verify transactions. The update also allows you to see each cards' virtual number at a glance, without having to click on some other link. The settings now include an update button, which wasn't there in previous versions. Samsung Pay is currently available on the Samsung Galaxy S6, Samsung Galaxy S6 edge, Samsung Galaxy S6 edge+, and the Samsung Galaxy Note5. 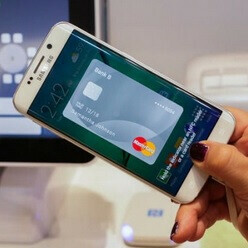 Unlike rivals like Apple Pay and Android Pay, Samsung Pay will work with NFC and with the magnetic bars on the back of credit cards. By supporting both, the number of retailers that accept Samsung Pay is much larger than the number that allow shoppers to use NFC based platforms. Besides running through a beta test in the U.S., Samsung Pay has had positive results from its launch last month in South Korea. What are the differences between Samsung pay, Apple pay and Android pay? Samsung pay works in way more places than the rest. Samsung Pay = Over 10 million stores accepted Apple Pay/Android Pay = 1.2 Million stores accepted Samsung Pay destroys Apple Pay and Android Pay, I've been using it for almost 2 weeks and it works flawlessly. If that's true then Samsung sure is ahead of this game. This is mostly valid in the US only since most of Europe and the third world upgraded to chip and pin long ago but Samsung still had that advantage. Apple pay is in more countries right now, Android pay is only in the US right now (but as with Android being everywhere, it will be everywhere faster than the other two). Google Wallet (before it was renamed to Android Pay) was already supported in many countries in Europe before Apple even announced its version. I wouldn't assume chip and pin also has NFC. Yes, anywhere you can use a card with a magnetic strip on the back the Samsung Pay will work there as well. Unfortunately for Android Pay and Apple Pay, the terminal at which you attempt to use those services must support NFC. Terminals that support NFC are greatly out numbered by your typical magnetic strip terminal. That being said this is one thing Samsung not only did right, but did first. Using the mag strip that is already in place at virtually every retailer restaurant hotel etc is genius! I saw a YouTube video of some guy using Samsung pay to pay for Chinese food at a rundown hole in the wall Chinese restaurant. The card reader looked liked it was one of the first reader's ever produced and it worked flawlessly. That right there told me this Samsung pay is legit. Not Just Verizon, I am on AT&T and they still have not pushed the update (5.1) to the s6 and s6 Edged which should include Samsung pay and they are a partner. There is 4 days left till launch and still no word from AT&T. What Gives? I hate carriers when they slow things like this down this is why there should be a class action suit against them. If I pay for a device and the features that a manufacture has built into them why is the carrier stopping them from being used?